LEXINGTON, Ky. (July 7, 2011) -- The University of Kentucky Alumni Association Distinguished Service Awards are presented annually to honor and recognize those who have provided extraordinary service to the university and the association. 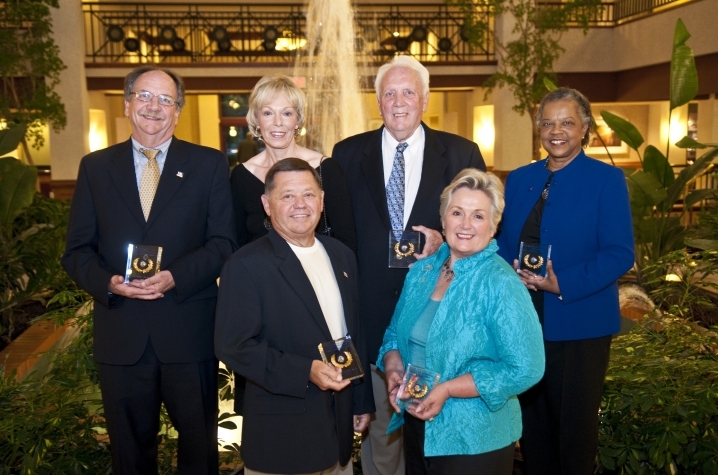 The 2011 recipients are John T. “Pete” Flaugher, Turner LaMaster, Peggy Meszaros, William P. Perdue Jr., Patricia “Patsy” Brantley Todd and Elaine Wilson. John T. “Pete” Flaugher has served three terms on the UK Alumni Association Board of Directors (1998-99, 2000-03, and 2003-06). During this time, he served on the Budget/Investment Committee. Flaugher has been actively involved with the Greater Nashville UK Alumni Club for more than 10 years, serving on multiple committees including chairman of the Scholarship Fund. He was also involved with instituting the Century Fund to raise contributions for the club scholarship fund. Flaugher is a Life Member of the UK Alumni Association, UK Fellow and donor to the King Alumni House Renovation Fund. In 2006, the Flaughers established the John T. and Paula B. Flaugher Scholarship Fund. Their endowment produces more than $2,000 in scholarship awards annually. Flaugher is a 1959 UK graduate with a degree in commerce. He is the former senior vice president of Franklin National Bank, retired from Fifth Third Ban,k and he is currently an owner/partner of Capitol City Scaffolding & Equipment Co. Inc. He and his wife, Paula Buchanan Flaugher, a 1962 UK graduate with a degree in elementary education, reside in Franklin, Tenn.
Turner LaMaster has a history of service to the UK Alumni Association that dates back more than 30 years to the formation of the Birmingham UK Alumni Club. He has faithfully served in every leadership position and is a member of the UK Alumni Association Board of Directors. His contributions of leadership, membership development and retention, and event participation include organizing the annual Derby Party, working the UK booth at College Fairs and coordinating club trips to athletic events. He has led countless fundraisers for the club scholarship fund and is the consummate friend-raiser. He started a new tradition by having the club participate in the Birmingham Tailgate competition for area and SEC schools. LaMaster has chaired planning committees and coordinated annual university functions such as hosting coaches for SEC Media Days and other visiting university dignitaries. He has actively participated in student recruitment nights over the years. LaMaster continues to support the arts and local charities in Birmingham and has organized club events to get the club members involved in the community. LaMaster is a 1973 UK graduate with a degree in business administration. He and his wife, Gina, live in Alabaster, Ala.
Peggy Meszaros is in the midst of serving her third term on the UK Alumni Association Board of Directors. She has served on the Budget/Finance, Scholarship/Great Teacher, Group Development and Strategic Planning Committees and was chairwoman of the Alumni Service Awards and Communications Committees. Meszaros received a master’s degree in home economics from UK in 1972. She returned to UK as dean of the College of Home Economics in 1985, where she served as the assistant director of the Kentucky Agriculture Experiment Station, assistant director of the Kentucky Cooperative Extension Service, was acting chairwoman of the Nutrition and Food Science Department, and acting chairwoman of the Family Studies Department. During her tenure at UK, she was instrumental in changing the name of the College of Home Economics to the College of Human Environmental Sciences to better reflect its mission. Meszaros was awarded the Outstanding Alumnus Award from the College of Human Environmental Sciences in 1995, inducted into the UK Human Environmental Sciences Hall of Fame in 2002, and the UK Alumni Association Hall of Distinguished Alumni in 1995. Meszaros left her position at UK to become dean of the College of Human Resources at Virginia Tech in 1993 and later became provost. She is currently the William E. Lavery Professor of Human Development at Virginia Tech and director of the Center for Information Technology Impacts on Children, Youth and Families. William P. Perdue Jr. served two years as president of the Greater Atlanta UK Alumni Club and continues to serve on the club’s board of directors. Perdue has served nine years on the UK Alumni Association Board of Directors and has served as chairman of the Communications Committee, as well as vice chairman of the Alumni Service Awards Committee. He is actively involved in student recruitment in the Atlanta area, representing the Greater Atlanta UK Alumni Club and the university at college fairs, as well as the annual Greater Atlanta UK Alumni Club Student Send-off. Perdue is a former partner of Re/Max Greater Atlanta real estate group, where he has served as president of the Re/Max Broker/Owners Council and director of the Gwinnett Board of Realtors. He is a current member of the local Kiwanis and YMCA and has served as a director of both organizations. He is a sponsor for the Children’s Miracle Network and the Susan G. Komen Race for the Cure. Perdue is also proud to be a Kentucky Colonel. He is a 1965 graduate of UK with a bachelor’s degree in mechanical engineering. He went on to obtain a Master’s of Business Administration from UK in 1968. Perdue and his wife, Marty, are Life Members of the UK Alumni Association and reside in Dacula, Ga. They have two children, Elizabeth and Paul, and two grandchildren, Trey and Kennedy. Perdue is well known in Atlanta for his leading of the “CATS” cheer. Patricia “Patsy” Brantley Todd has participated in numerous alumni receptions, programs and events with her husband, former UK President Lee T. Todd Jr., and has hosted the UK Alumni Association Board of Directors at Maxwell Place. There is no greater "roaring advocate" for UK and its alumni than Patsy Todd. There are few areas of the university that are not appreciated and supported by Todd. Student recruitment; the care and concern for students attending UK; unwavering support for faculty, researchers and staff at UK; her particular love for the UK band, vocal music department, UK Opera Theatre and the UK Symphony Orchestra; and her interest and efforts to raise funds for colleges and programs across the university, most visibly as co-chair of the Women and Philanthropy Network and the UK Undergraduate Advisory Board. She serves on the board of the Lexington Opera Society which supports UK Opera Theatre, and she is a founding member of the Women’s Circle, the primary endowment program of the Center for Research on Violence Against Women. In addition, Todd serves on multiple boards and committees in the Lexington community. Todd obtained a bachelor’s degree in human environmental sciences from UK in 1968. She has a master’s degree from Simmons College in Boston, Mass., and she has taught nutrition at the high school level in that state. Lee and Patsy Todd have two children, Troy Todd and Kathryn Norman. Elaine Wilson has held various roles as a member of the UK Alumni Association, including serving as the current chairwoman of the Diversity and Group Development Committee and a member of the executive committee. She has also been a member of the Diversity and Group Development Committee and was past president of the Lake Cumberland UK Alumni Club. Wilson has been a Life Member of the UK Alumni Association since 1987. Wilson is a 1968 graduate from the UK College of Social Work. She has served her alma mater as a member of the Social Work Advisory Board, Friends of Music Donor, and the UK Board of Trustees from 1999-2005. Wilson was an associate facility director at Oakwood Training Center and the director for cultural diversity at Somerset Community College. During her career she has served on numerous boards and committees. She also sang with the Lexington Singers for several seasons and traveled to Washington, D.C., where she participated in the “Our Lincoln” program at the Kennedy Center.